One of the very most frugal things one can do is to use ALL of the chicken. Yes, even the neck and gizzards! We only buy pasture chicken (free-range and organic), so I find it even more important to get my money's worth out of it. As an aside, our Wild Oats is switching over to Whole Foods since they were bought out. The Whole Foods brand chicken does not include the neck and gizzards, so I have informed them that I will be getting my chicken elsewhere in the future. I used to worry about making my chicken stock because I didn't have leeks or fresh herbs for a bouquet garni. My mother-in-law said that I didn't need all of that. Onions and celery work perfectly by themselves. So now I just throw in celery, quartered onions and some salt and pepper and voila!--chicken stock for pennies! Here is how I do it. FYI, the neck and gizzards make a much more rich stock, but since this was my first Whole Foods chicken, I didn't have that luxury! First, I stewed 2 chickens all day in the crockpot. I find it best only to cook until it's done, then the carcass isn't falling apart as mine will be, but it works either way! Separated into meat, skin and bones. In the pot with celery and onions. Add water to cover, along with salt and peppercorns or freshly-cracked pepper. Straining the chicken parts from the broth. I then had the lighter stock(right) from the chicken stock and the more concentrated broth from the crockpot during the actual cooking. Simmer together for a short time for yummy chicken broth! 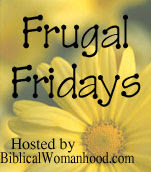 Check out here for more Frugal Friday ideas! Are the Wild Oats/Whole Foods chickens cheaper than the ones at the Apples? I haven't been to Wild Oats in a long time because I think they are really expensive, but I'd go if they had cheaper chicken! How expensive are they at the Apples? I haven't checked for awhile. I usually just run in, grab eggs and cheese and anything else in the fridge and leave. Do they include the necks/gizzards? I may be buying from there from now on. !